A first-of-its-kind survey conducted by Education Development Center (EDC) and SRI International found that most parents of young children believe they share responsibility for helping their children gain academic skills and would welcome ideas and resources that support science learning. 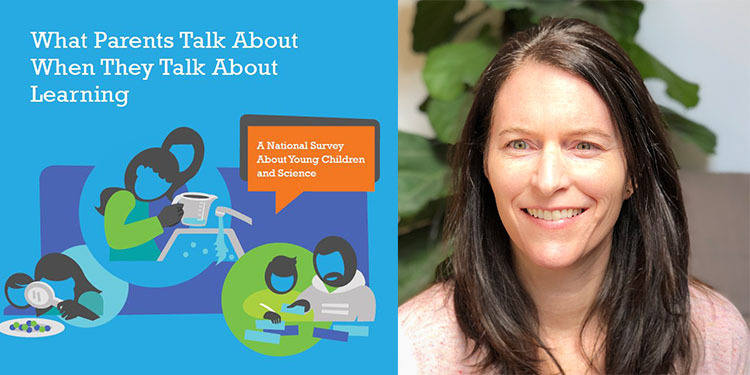 The study, What Parents Talk About When They Talk About Learning: A National Survey About Young Children and Science, was funded by the U.S. Department of Education’s Ready to Learn Initiative, in partnership with the Corporation for Public Broadcasting (CPB) and PBS. CPB talked to lead researcher Shelley Pasnik. Q: Why this study now, and what makes it unique? A: Previous research has demonstrated that parents are crucial when it comes to early learning experiences, but little is known about how parents of young children approach learning science. What better way to find out more then to ask parents – in this case more than 1,400 of them! Q: What are the major findings and why do they matter? First, nearly all parents think it is important to help their young children learn and 94% engage in learning activities, such as reading stories or doing puzzles, with their children on a daily basis. Second, most parents are confident about their ability to teach their young children literacy, math, and social skills but fewer parents are confident about science. Third, parents want to do more science but need ideas and resources to build their knowledge and confidence. And last, many families say they use science media weekly or more, particularly videos or TV shows about science, yet parents may be missing opportunities to deepen the impact of these experiences. Q: What did you discover about families and learning in general? And about families and science in particular? Q: Why does science learning matter, especially for young children? A: Science is an essential part of learning, especially for preshool-age children who have a natural curiosity about the world, and are constantly asking “Why?” and “How?” questions. With help from parents and other caring adults in their lives, early science experiences help children develop important thinking and reasoning skills they need to become creative problem solvers. Q: What did you learn about the role of media in supporting children’s learning? A: We know that broadcast and digital media can be powerful tools for learning. TV programs have the power of story and character. Apps and online games have the power of interactivity. Mobile technologies have the power of accessibility. What this survey showed, though, is there is unrealized potential when it comes to supporting children’s science learning with media. Many parents say their children are using science media, but they don’t think they are necessarily learning a lot from them. Q: What new opportunities do we have in public media to better support parents and children learning together? A: We have five essential messages in the report, including this one: “Science is watchable, readable, playable and doable.” Local public media stations and their education staff and producers can inspire and encourage parents, showing them how to use everyday opportunities to help their children learn science. And, they can give families high-quality, developmentally appropriate resources from PBS KIDS made just for them. PBS, CPB, and local stations can get this message and these resources out to the widest public audience, reinforcing the importance of early science in and out of school. Q: What do parents say they would like help with, and why? Q: What recommendations do you have for families that want to engage in science learning activities with their children? A: You don’t have to be a scientist or know the “right” answers to do science. You can build on your child’s curiosity by asking questions and looking for answers together. A good place to begin is by wondering aloud, letting your child know you also are curious about the world around you. Q: How can people learn more about the study and its findings? A: Our complete report, which includes rich descriptions of parent experiences in their own words, a full set of findings, survey questions, data tables, key takeaways and much more, is available online. PBS KIDS has gathered family science activity ideas on PBS LearningMedia and on the PBS KIDS YouTube Channel. Also, we’re encouraging folks to use #take5forSci to share easy ideas for supporting early family science.